According to a statement by JAXA this morning, Kaguya's launch is going to be postponed by one day, to September 14, 2007 at 10:31:01 am JST (01:31:01 UTC, and September 13 at 18:01:01 PDT). In the meantime, here's a website with lots of photos of the spacecraft being prepared for launch. There's not a lot of caption information, but I am guessing that the first one shows the spacecraft being mated to its upper stage rocket, and the second one shows it enclosed inside the protective aerodynamic fairing, ready to be mated to the lower stages of the H-IIA launch vehicle. 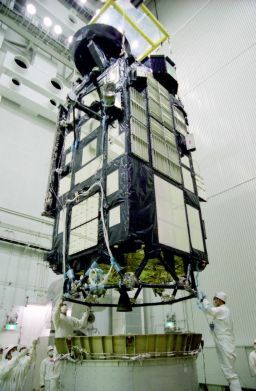 On August 28, 2007, Kaguya is mated to its upper stage rocket.